Evidence of Grace: When the Marriage is Over But the Relationship Lives On . . . I was tempted to title this article, “Miss Congeniality Wins Again,” but I suspect that Sandra Bullock doesn’t really see it that way, and I certainly don’t want to be insensitive or appear disrespectful. What I am is completely impressed and a bit in awe of how she handled herself through her recent personal and family crisis. When most people hear the words “graceful” and “divorce” in the same sentence, they think to themselves, “Yah, right!” But Sandra Bullock’s handling of her situation is exactly that. She has modeled a “graceful divorce” for the rest of us. A recent study shows that divorce is contagious and can spread—through family, friends and co-workers. In fact, the researchers found that couples whose close friends had split were 75 percent more likely to get divorced themselves. They call this trend “divorce clustering.” Surely this is disturbing news for many married folks who have friends who are divorcing. I work with parents and children experiencing divorce every day. Sometimes I’m the lawyer for Mom or Dad, and sometimes I’m the lawyer for the children. As the lawyer for the children (called a Guardian ad litem), I’m appointed by the court to represent the “best interests” of the children. Collaborate or Mediate? Part II – Which way do I go? You want a civilized, respectful resolution of your issues. Comments Off on Collaborate or Mediate? Part II – Which way do I go? This is a question I’ve been getting from clients lately with increasing frequency. 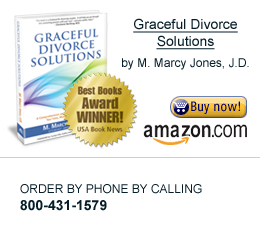 When they make that decision to pursue divorce, and they want to go through that process as “gracefully” as possible, they have a number of choices. There is no “one size fits all” way of divorcing, so their decision will be based on their personal situation, needs, and relationship with their spouse. What they want to know, and often have a hard time grasping, is the difference between Collaboration and Mediation. Stalking – Be Wise, Don’t Minimize! Recently there have been a number of sad and disturbing stories in the news about stalking crimes, including murder of stalking victims. And recently I’ve had a number of clients who have definitely been victims of stalking behaviors by their “former” significant other. As a bystander, I was able to see the red flags all over the place, and once I pointed out the classic stalking behavior to my client, you could almost see a shiver go through them. It is very scary to be on the other end of a stalker’s attention.